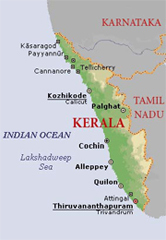 Kerala lies between north latitudes 8.17'.30" N and 12. 47'.40" N and east longitudes of .27'47" E and 77.37'.12" E. Periyar, Bharatapuzha, Nila, Pamba, Chaliyar, Kadaundi, Achenkovil, Kalada, etc. are the major rivers that flow in the state. About 44 other rivers are there that flow in the state. There are some mountains in the state namely Anamala, Karinkulam, Mukutti, Devimala,etc. Vembanad, Kayamakulam, Ashtamudi, etc. are some of the lakes in Kerala. 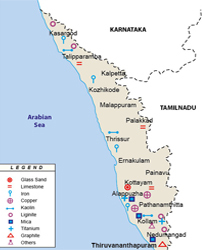 There are fine beaches at Kovalam, Varkala, Vizhinjam, Shankumukham(Trivandrum), Muzhipilan, Kappad (Kozhikode) and at other places in the state. There are fine waterfalls in the state at Athirapally, Palaruvi and Vazhachal which attract the tourists. The state has a coastline of 580 km.The state has a humid tropical wet climate for most part of the year. Kerala is home for various mineral deposits like Bauxite, Quartz, Silimanite, Monozite, Kaolin among others. The availability of minerals in such a large quantity is a great asset to the economy of the state. Large amount of area of the state is covered by China Clay. This is the important raw material in the manufacture of porcelain items, glazed tiles, etc.